Stressed Out! 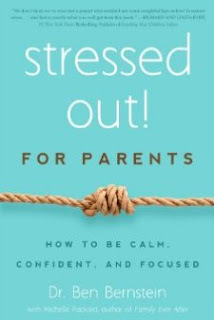 For Parents: How to Be Calm, Confident & Focused by Dr Ben Bernstein with Michelle Packard, author of Family Ever After. Stressed out is a bit different to the books that I normally review on Life with Aspergers, particularly because it has no direct connection to autism. Nevertheless, stress is something that most parents are very familiar with, particularly parents with children on the spectrum. Stress is also something that people with Autism, Aspergers or Anxiety experience a great deal. Throughout the book, it sets up scenes of parental stress ranging from bad behaviour to unmet expectations and full-on family disputes. In those early chapters, I kept expecting the information on calming down to be followed by alternate and workable solutions. There are no solutions to parenting problems in this book. It's simply “not that kind of book”. This book aims to make you a better parent but not because of solutions to specific problems. Like the serenity prayer, this book helps you to find your calm centre through the recognition and acceptance of the things that you cannot change. For example, you want your daughter to clean her room and you become stressed when it doesn't happen. The book doesn't teach you how to motivate or coerce her into doing the work but teaches you to recognise that the stress and the expectations are coming FROM you. You’re bringing those to the table, not your daughter. At the end of the day, it’s better to have a messy and happy family than one that is stressed. The book covers three major concepts and presents three “tools” to help with each. I'm not personally sold on every single one of the concepts in the book but that doesn't mean that they won't be more effective in the hands of people with a less cynical point of view. Certainly the main stress reduction concepts are valid. With acceptance out of the way, the book concentrates on empowerment, giving parents the tools to boost their personal confidence and the confidence of their children. It’s the second part of the serenity prayer; the courage to change the things you can. As it turned out, my review copy of Stressed Out! arrived during a particularly stressful time for me (actually, the last three years or so have been super stressful). I found it very helpful and I'm now approaching my oncoming stressful "event horizon" in a much calmer manner. 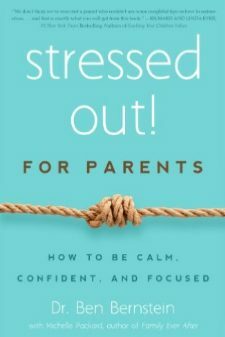 I'd recommend this book to anyone who is feeling overwhelmed by the stress in their life, regardless of whether or not it's "parenting stress". Stressed Out! is published by familius and is available from Amazon in Kindle, Paperback, Hardback and Audible formats. It's also available from Goodreads. Honesty clause: I was provided with a copy of this ebook free of charge for review purposes.